Beautifully engraved certificate from the Lum's, Inc. issued in 1973-1976. This historic document was printed by the American Banknote Company and has an ornate border around it with a vignette of an allegorical woman sitting, holding a globe under her arm, in front of a city scape. This item has the printed signatures of the company�s president and secretary and is over 24 years old. 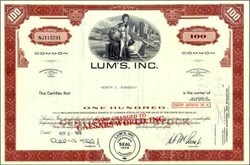 This Lum's, Inc name was changed to Caesars World which is stamped in red across the face of the certificate.